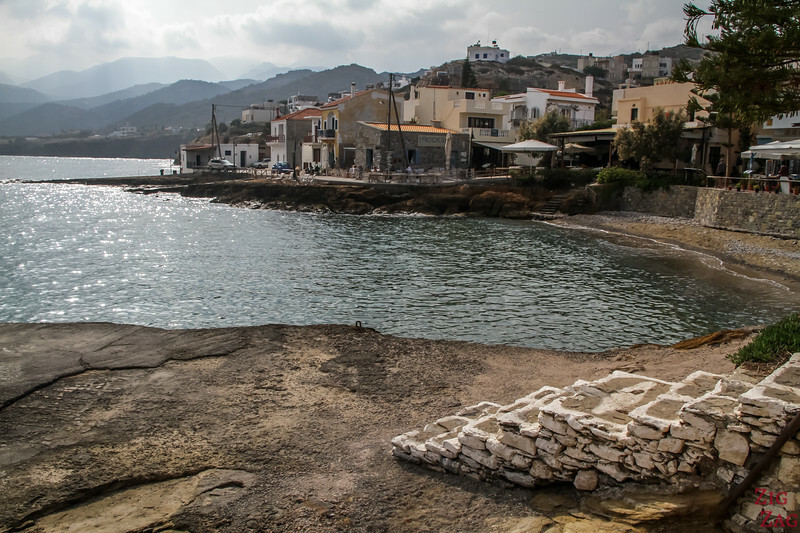 Off the beaten path, the charming fishing village of Mochlos is a great place to relax and eat good seafood. 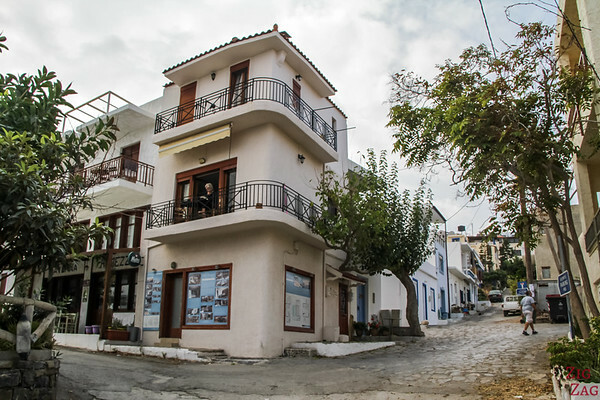 Unspoilt by mass tourism, the village has kept a low key atmosphere with traditions still alive. It is worth the detour. Below is my guide to help you plan your visit. 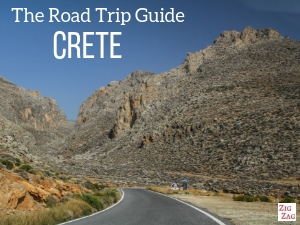 Most touristic places in Crete are crowded and very noisy. Be careful not to mix-it up with Mochos (without the l) a typical mountain village known for its traditional dinner parties. 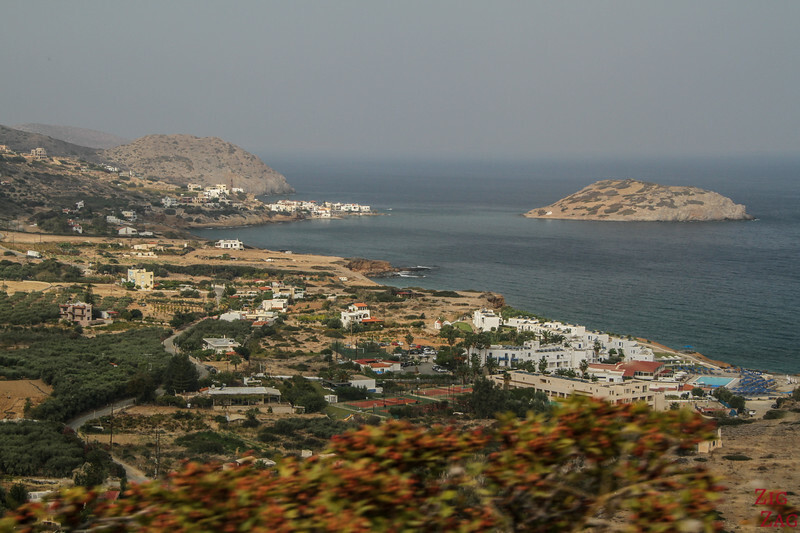 Where is Mochlos in Crete? The only way to reach Mochlos is by car with the last few km down a mountain road. There are only a few spot along the roads, so just follow the signs to find the free parking area. Close to the water, you will find mostly rental accommodations or small hotels. The village has kept its charm without big chains or loud party hotels. Note: there is only a mini-market in the village so if you are staying longer than a night you should shop for food before. You can already enjoy Mochlos on the drive down the mountain. 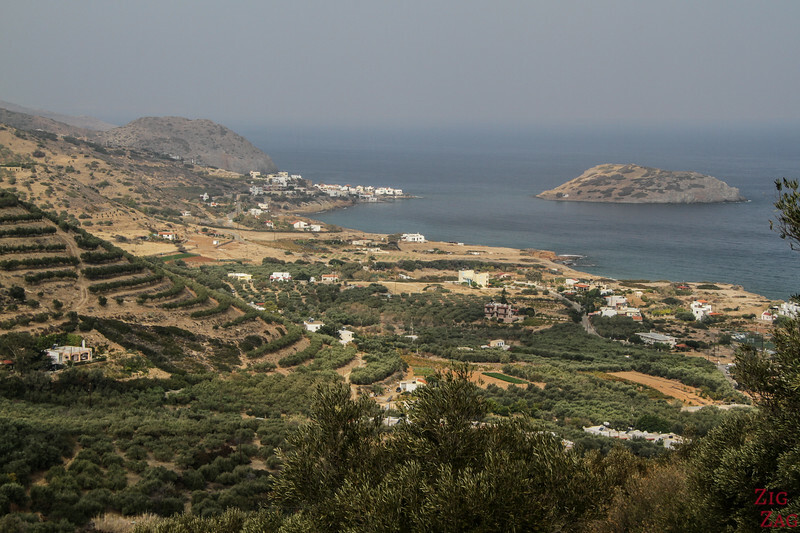 The village is located on the North coast, niched across from the small island of Mochlos. It is not a difficult drive, but the road is a little smaller and winding. What is enjoyable is that you can walk along the water without being bothered by cars. 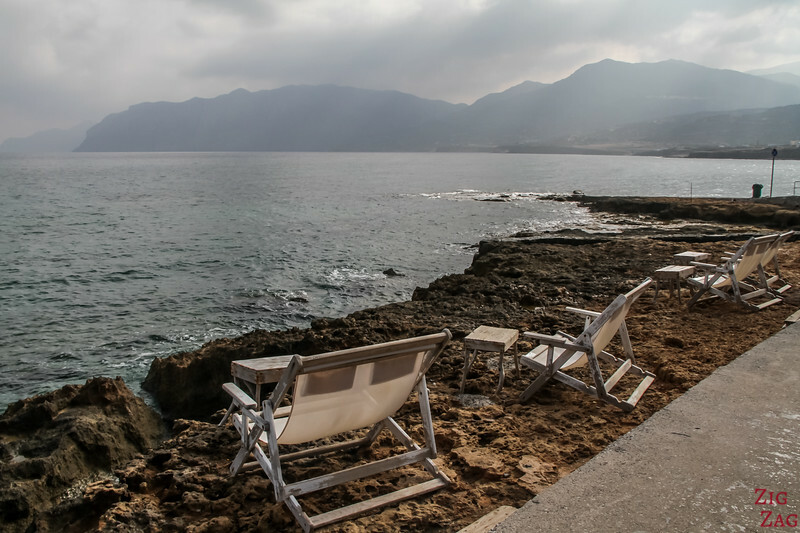 There is a pedestrian way along the taverns and shops to admire the views of the mountains and the sea. It is a short walk (the village is small) but a very enjoyable one. 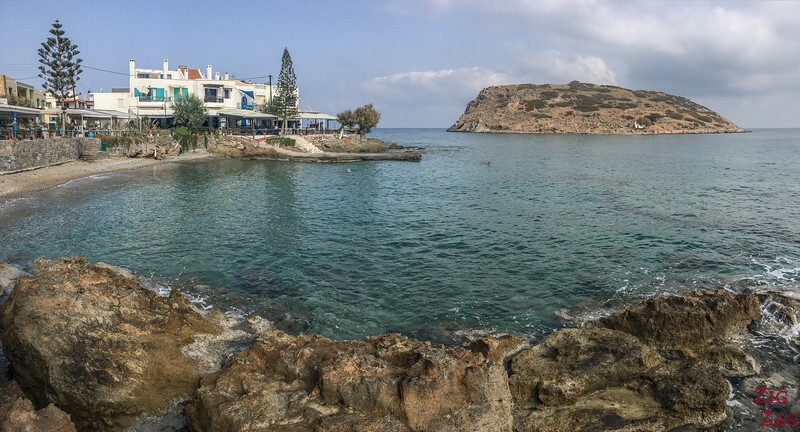 It was one of my mom's favorite places in Crete. 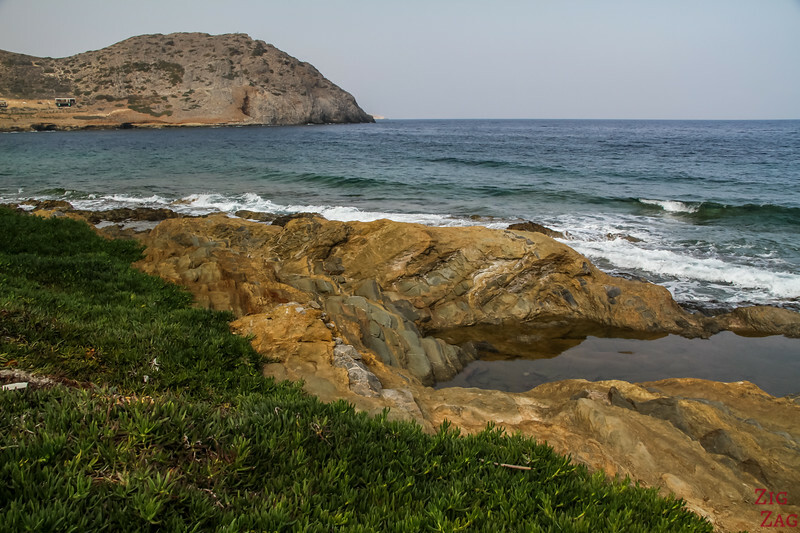 You can see how close the islet is creating a small harbour. The taverns have terraces to enjoy the deep blue of the water and the sunny weather. But what I love the most are the beautiful rocks sculpted by the sea (I always love rock formations). You can see a few examples in the pictures below just below the taverns and also on the back side of the village. Mochlos is not really a beach destination. But you can still enjoy the waters of the Mediterranean. 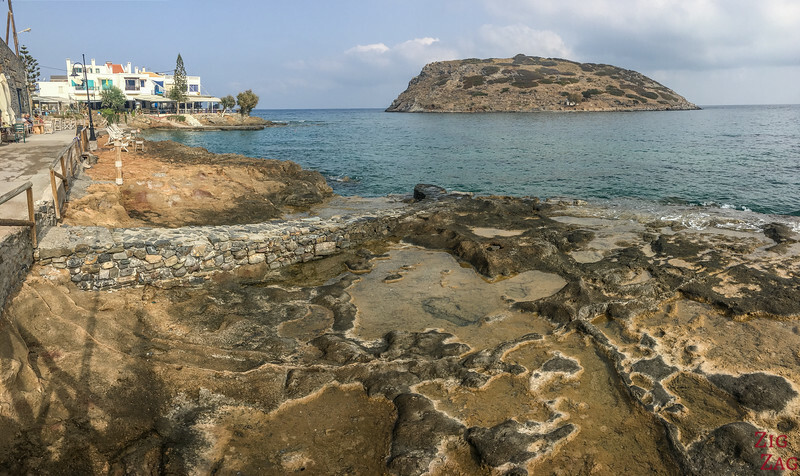 The area is mostly rocky beaches, but there is a small beach right in the middle of the village with a slow slope and some sand. Not much space to lie down but enough to get into the water. Just be careful that the area has urchins, so it is recommended to wear plastic shoes. In the morning you may be lucky to see divers collecting them for the taverns. 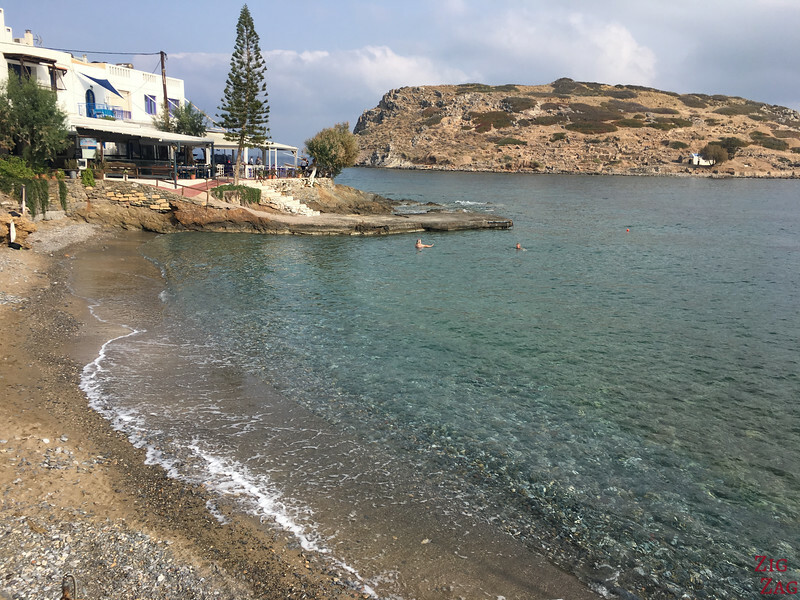 If you keep walking West from the village, you can find another beach with sand near the harbour which is less in plain sight of all the tourists at the taverns. It is the fishing port of Limenaria (sorry I did not take a picture). 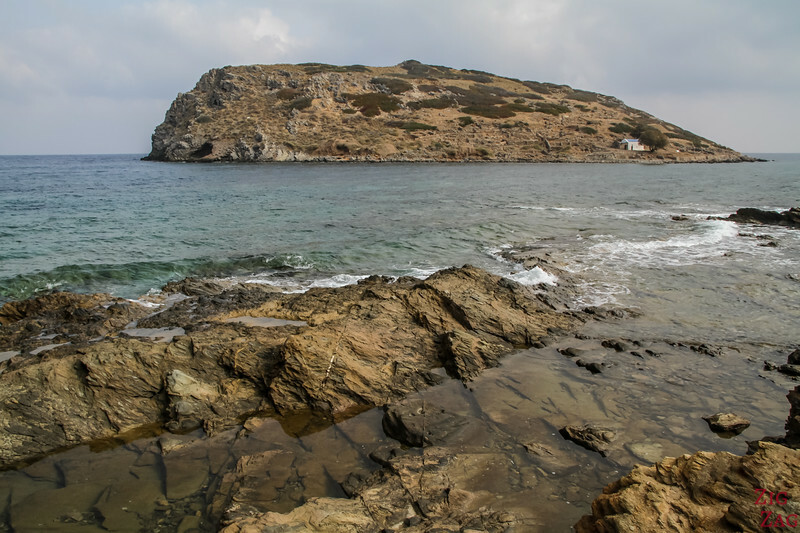 Mochlos island is a very little known Minoan site. You could be exploring it by yourself. It was discovered by the American archeologist Seager in 1907 with the help of local fishermen. 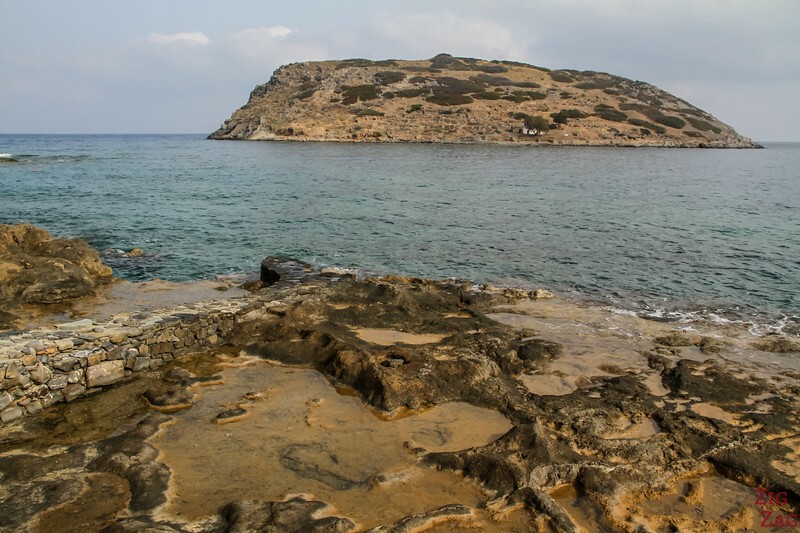 The excavations in 1908 have unearthed tombs and habitations from thee Minoan civilization. There is also a small chapel dedicated to St Nicholas. 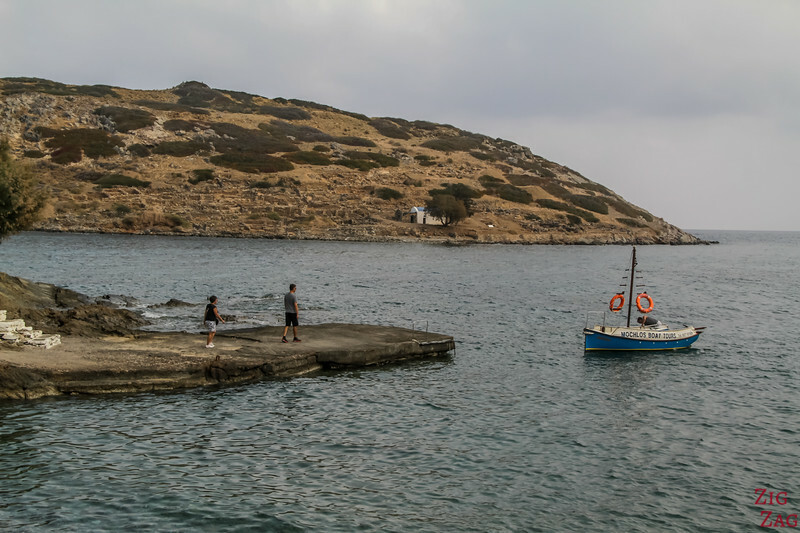 This is why the island can also be referred to as the islet of St Nicholas. It is within swimming distance (around 200m) but can be dangerous with the swell. A local can take you on his boat for a few euros. Just ask at one of the taverns or shops. 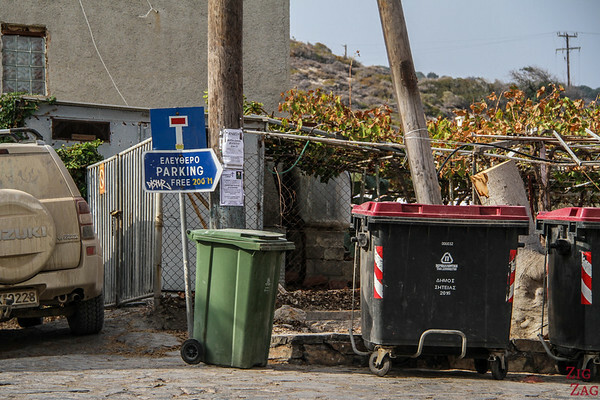 If you are into archeology, 2 buildings were also discovered behind the modern village of Mochlos. They belonged to artisans (pottery and Bronze crafting). 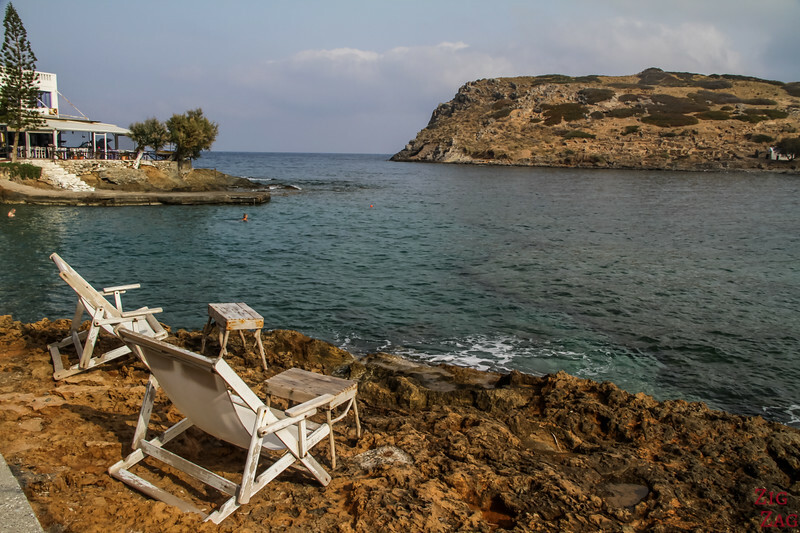 If you are planning a road trip around Crete, Mochlos makes for a great stop and a quiet evening. But Mochlos can also make a great base for a quiet holiday.